NexGen High Rise Services is the Midwest’s premier professional high-rise window cleaning company. We offer complete window cleaning and consulting services to building owners, managers, architects, and engineers. Our management team combines 80+ years of experience in cleaning windows for commercial, educational, and medical facilities. Call us today to explore how NexGen High Rise Services can help you meet your commercial window cleaning needs. 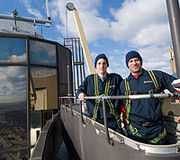 Joe Beaudoin – the founder, CEO, owner, and President of NexGen High Rise Services – is a third-generation commercial window cleaner. He has been involved in the window cleaning industry for over 30 years. Want a commercial window cleaning company you can rely on? Consider this: NexGen High Rise Services has a 100% safety record. No injuries. No accidents.